The old saying goes, “defense wins championships.” While that saying may not be absolute in its certainty, it is undoubtedly true that a great defense can elevate a mediocre offense all the way to the playoffs and beyond, and in today’s NFL, a great defense is almost always headlined by the elite play of an edge defender. 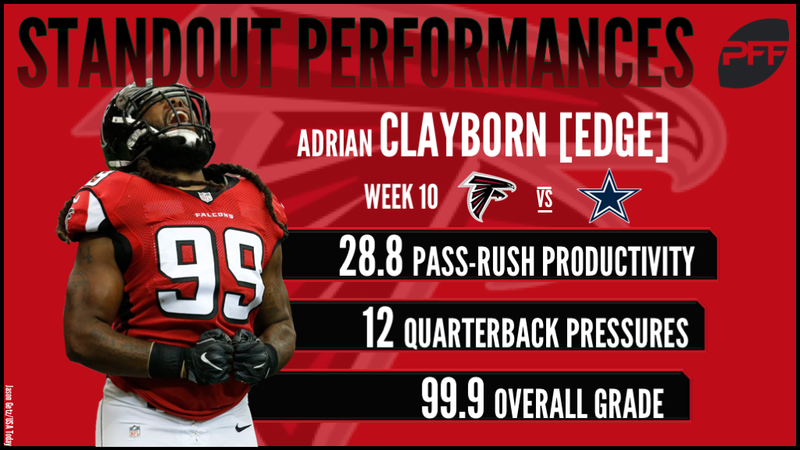 While the NFL is stacked with elite talent at the position, we were treated to more than our fair share of remarkable performances, but the highest single-game grade of the season by an edge defender was brought to us by none other than Atlanta Falcons edge rusher Adrian Clayborn after his staggering Week 10 performance against the Dallas Cowboys. During the contest, Clayborn played almost exclusively as a pass-rusher, with 33 of his 40 snaps coming via the pass-rush, and it was in those situations where he produced a performance for the ages. On those 33 snaps, Clayborn proceeded to rack up 12 pressures, which included five sacks, five hurries and one hit. With Pro Bowl left tackle Tyron Smith out with an injury, the Cowboys had turned to third-year offensive lineman Chaz Green to man the blindside and keep Clayborn at bay. However, Clayborn quickly took advantage of the mismatch and took Green for a ride, to the tune of four sacks, three hurries and one hit before Green’s benching in the second half. In Green’s place came Byron Bell, who did a better job at fending off Clayborn, but he still surrendered a sack and two hurries while trying to do so. 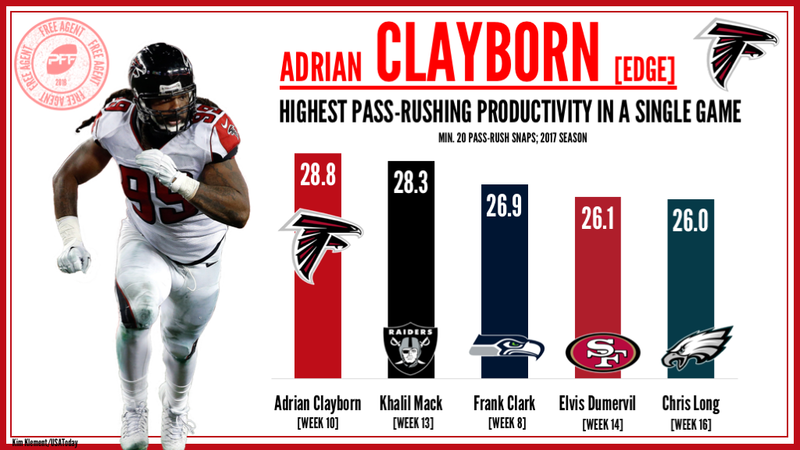 Clayborn ended a masterful pass-rushing performance with a pass-rush productivity (the PFF metric that measures pressure produced on a per snap basis with weighting towards sacks) of 28.8, the highest single-game rating of the season among edge defenders with at least 20 pass-rushing snaps. His performance also earned a pass-rushing grade of 99.9, the highest grade possible, making him one of just six players to achieve this feat since PFF started grading games back in 2006. In the last 12 years, only four defensive players have achieved an overall game grade of 99.9, and Clayborn’s dominant Week 10 performance is more than deserving of the honor, as he single-handedly brought the Cowboys passing attack to a standstill. However, while it was by far his best performance of the year, it wasn’t his only strong showing, as he ended 10 of his 18 games this year with a game grade of at least 75.0 or higher. Clayborn ended the year ranked 19th among edge defenders with an overall grade of 85.5, making him one of the highest-graded free agent edge defenders in this year’s free agency class. Hughes recorded seven total pressures as a pass-rusher and provided two stops against the run and was truly disruptive force against the Dolphins offense. Throughout the game, Bosa was almost unblockable and proceeded to produce seven total pressures, which included two sacks. Lawrence produced two stops against the run but was at his best in the pass-rush, where he tallied one hit and six quarterback hurries. In a dominant performance against a struggling offensive line, Clowney ended the day with one hit and seven hurries to go with two tackles for a loss in the run game.